A new marine wildlife visitor centre has been launched in Tobermory on the Isle of Mull by conservation charity Hebridean Whale and Dolphin Trust – to strengthen conservation action for whales, dolphins, and porpoises, and to develop the Hebrides' appeal as a wildlife tourism hotspot. The Hebridean Whale and Dolphin Centre on Tobermory's picturesque harbour front was formally opened this month, and will be a learning, training and volunteering hub, as well as providing a major attraction for visitors, including families and children. The building's transformation has been funded as part of a grant of almost £220,000 from the UK Government's Coastal Communities Fund. The fully renovated and extended centre features information on sightings of cetaceans – the collective name for whales, dolphins and porpoises – interactive exhibitions, displays and a gift shop. “Our new centre aims to put Mull and the Hebrides even more firmly on the map as a key destination to enjoy and discover world-class marine biodiversity – which in turn will boost conservation, and could bring significant economic and social benefits to the region,” said Alison Lomax, Director of Hebridean Whale and Dolphin Trust. The centre was recently launched with a celebratory event attended by dozens of guests from across the UK, including conservationists, scientists, volunteers and local businesses. 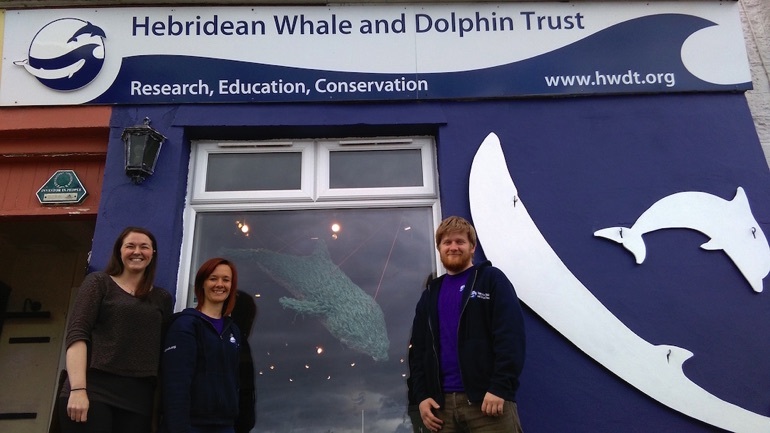 The trust's previous shop and visitor centre attracted 26,000 people in 2015 – a figure that Hebridean Whale and Dolphin Trust hopes will now rise significantly. With Western Scotland's seas being one of Europe's most important cetacean habitats, the charity believes that developing sustainable marine wildlife eco-tourism is a major opportunity, as demonstrated by the benefits of white-tailed eagles to the local economies of Mull and Skye. So far 24 of the world's estimated 92 cetacean species – including many national and international conservation priority species – have been recorded in the region, and fascinating new discoveries about these populations are constantly being discovered. The Coastal Communities Fund has also enabled the trust to carry out an innovative Sea Change project across the Hebrides over the past two years, to strengthen people's connections to the sea in remote island communities. This has involved engagement with thousands of people, through roadshows, community visits, liaison with wildlife tourism businesses, and dozens of events. Responsible whale watching, WiSe (Wildlife Safe) accredited, training has been provided for 23 tour boat operators, while local people have been able to develop skills through the trust's Community Sightings Network – through which people can report sightings of cetaceans, helping to map their distribution. Sea Change has been carried out on Mull, Coll and Tiree, Islay and Jura, Colonsay, Barra, Small Isles (Eigg, Muck, Rum, Canna), Mallaig and Arisaig, North and South Uist, Harris, Lewis, Gairloch and Skye. The Coastal Communities Fund has also funded a refurbishment of the trust's research yacht, Silurian, aboard which marine scientists and volunteers conduct surveys monitoring cetaceans each year. More than 90,000km of Hebridean seas have been surveyed and over 18,000 individual cetaceans recorded so far – significantly extending scientists' knowledge and understanding, and informing long-term conservation initiatives. Paying volunteers are being recruited for the trust's 2016 expeditions onboard Silurian, working alongside marine scientists. For details, email volunteercoordinator@hwdt.org, call 01688 302620 or visit www.hwdt.org. The Coastal Communities Fund was created to direct regeneration investment to seaside towns and villages to help rebalance local economies, reduce unemployment and create work opportunities for local young people.